It’s been almost one and a half years since I joined MAPS College to pursue higher studies as part of the first-ever batch of “MAPS’ Associate’s Degree in Business Management”. It’s been a wonderful experience as a part-time student, studying on block-mode. The recent introduction of “Google classroom” has been quite a break through as we get the chance to interact with classmates and lecturer in the comfort of work or at home while the text books and lecturer’s teaching material are made available too. Assignments can also be done and turned in via it. The College has a great collection of reading material in its Library equipped with computer systems that enable us to browse the Internet while going through printed references. One of the most frequently met person at MAPS is the course coordinator Ms Inasha Afeef, who has worked tirelessly over the last 18 months. She has been prompt to our queries & available almost instantly to have discussions on any matter related to the course. She’s also ensured that MAPS provides quality lecturers for our modules & I don’t recall that any module has been postponed or cancelled due to the lack of lecturers. As far as the Lecturers go, each and everyone has been very diligent and professional while teaching us. Their command of the subjects as well as vast experience in their respective fields have been an added bonus for us as we get the chance to exchange ideas, real life examples to during the lectures. One particular lecturer I’d like to commend is Ms Eeman Shareef who has taught us 6 modules from a total of 16. When she initially joined & started teaching in June 2013, she was a part-time lecturer & currently a full time lecturer at MAPS. During the course of the last 18 months she has been one of the instrumental figures in encouraging us in our endeavour to successfully complete the course. Her advise, continued guidance, support and unique way of teaching has been a tremendous encouragement in our short journey at MAPS so far. After the completion of this course I do plan to pursue MBA at MAPS College too. This course is part of the MAPS College’s Information Technology Study Programme and the second year of the MAPS BSc in Information Technology (Software Development /Network Management) course. The main aim of the MAPS BSc in Information Technology course is to allow students to become IT specialists who have an excellent combination of knowledge and practical, hands-on expertise to design, implement and manage an organisation’s technology infrastructure and support the people who use it. The graduates of the MAPS Associate’s Degree in Information Technology course would have completed two-thirds of the requirements necessary to achieve MAPS BSc in Information Technology degree. There are two entry routes to this course. Students gaining entry into this Associate’s Degree programme after completing their MAPS Diploma in Information Technology course can complete this Associate’s Degree course in 1 year while students students who gain entry after completing their MAPS Foundation Studies in Information Technology would require 2 years to complete this course. Certificate for this course will be awarded by MAPS College. » Completed MAPS Foundation Studies or MAPS Level 4 Advanced Certificate in Information Technology and meets the Language Requirements. » Qualifications equivalent to MNQF Level 4 or above in the field of Information Technology. One Year MAPS Associate’s Degree in Information Technology (for students who gain entry after completing MAPS Diploma in Information Technology). 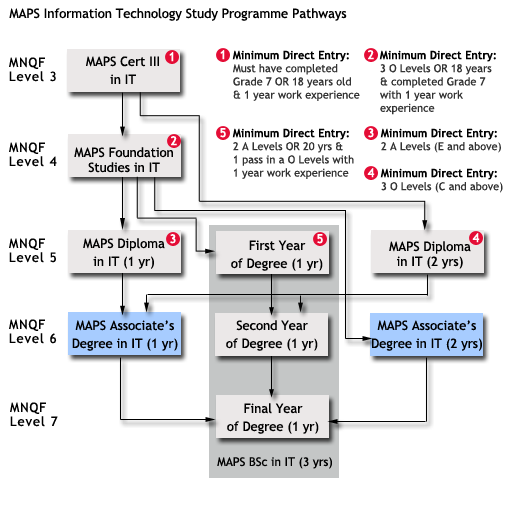 2 Year MAPS Associate’s Degree in Information Technology (for students who gain entry after completing MAPS Foundation Studies in Information Technology). All the units are assessed by time-constrained written exam and by coursework. (i.e. assignments, presentation, oral-test, case-studies, etc). Payments can be made in installments. Please see Course Fees and Payment Plan for information. Student who completes the MAPS Associate’s Degree in Information Technology can join directly into the final year of the MAPS BSc in Information Technology (Software Development / Network Management) course. 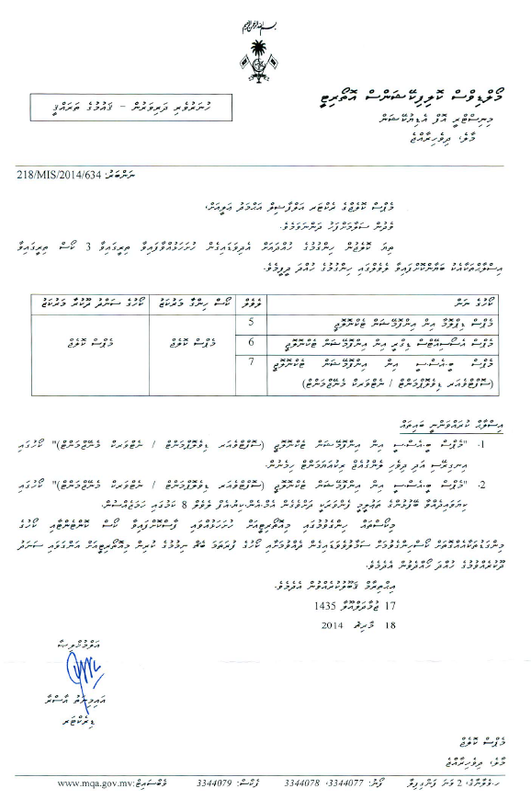 Candidates may apply online or download and complete application, which can be submitted to College Reception on the First Floor of H. Vaifilaa-age, Janavaree Magu. Applicants are requested to read the Terms and Conditions for Studying at MAPS College before applying. MAPS College Beats ACCA Global Pass Rate! MAPS College, the winner of the President's Award, established in 1999, is the longest serving college offering ACCA, ABE, CTH, Edexcel, AIB and University of Bedfordshire programmes in the Maldives. Did you know? MAPS College’s MBA students attended the AIB graduation ceremony in Adelaide, Australia in 2016! Did you know? MAPS College has its very own Research and Postgraduate Studies Department! Did you know? Every qualification at MAPS College is fully approved by the Maldives Qualification Authority! Did you know? MAPS College teaches sponsored students from over 30 different organisations! Did you know? MAPS College has just updated its Advanced Certificate IV in Business Administration to make it even more focussed on employability! Did you know? Students can now join MAPS College Associates Degree every month! Did you know? Students can now join the MAPS College Foundation Studies in IT every month! Did you know? Students can now join the MAPS College Advanced Certificate IV in Business Administration every month! Did you know? Students can complete the University of Bedfordshire BA (Hons) Business Administration Top-up in just 8 months! Did you know? MAPS College students have a pass rate of over 90% on the AIB MBA modules!